Dimensions 719'6" by 87'7" by 26'9"
1943? : Added Type 13 air search radar and Type 21 general purpose radar. 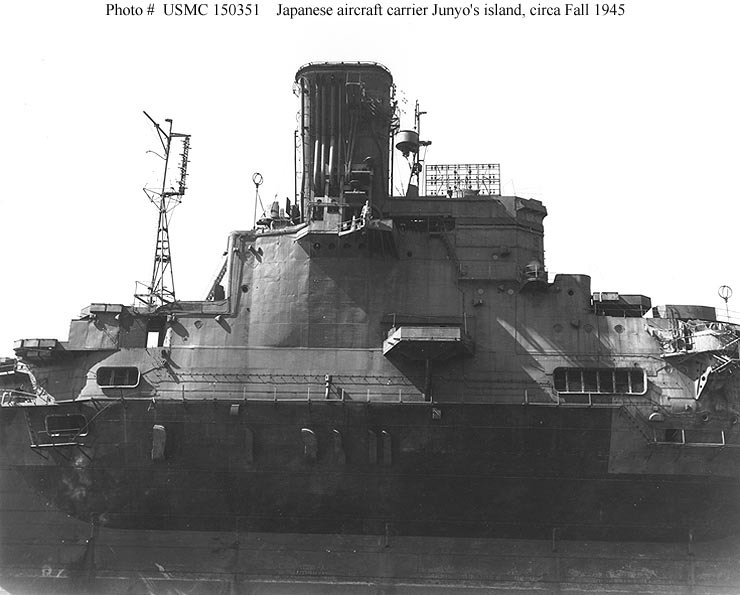 1944: Total of 76 25mm guns and 6x28 5" rockets. Concrete added around gasoline bunkers. 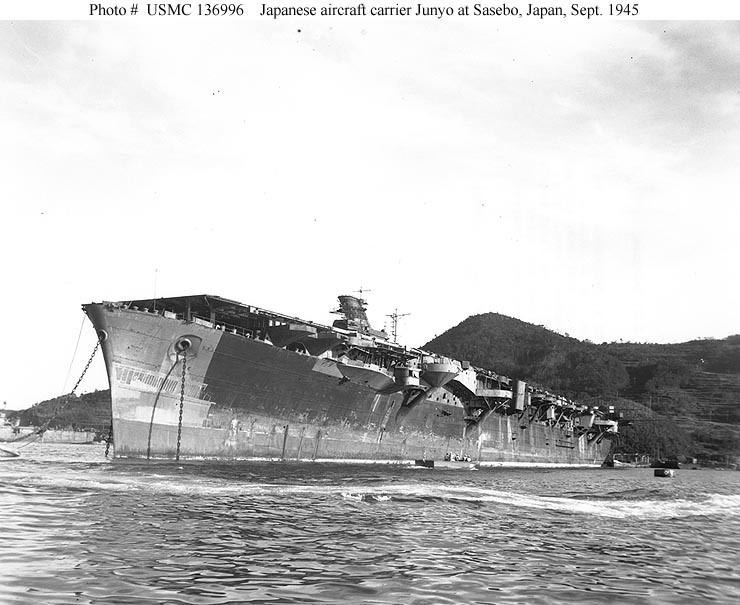 The Junyos were laid down in 1939 as 27,500-ton passenger liners Kashiwara Maru and Izumo Maru. Part of the "shadow program," they were designed with destroyer machinery and were converted to light carriers on the ways. They retained much of their civilian character, including clean hulls, forward sheer, and inadequate subdivision. 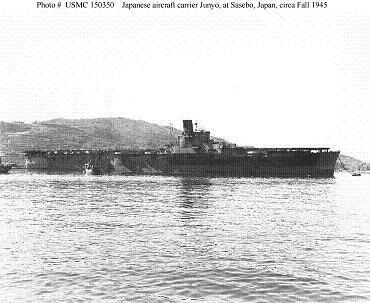 Though rated as fleet carriers on account of their relatively large air group, their speed was inadequate for fleet operations. The two hangar decks were cramped, the lower having barely enough ceiling clearance for the A6M "Zero", let alone carrier bombers. The ships had almost no armor protection, which with their poor subdivision meant that their survivability in battle was minimal. 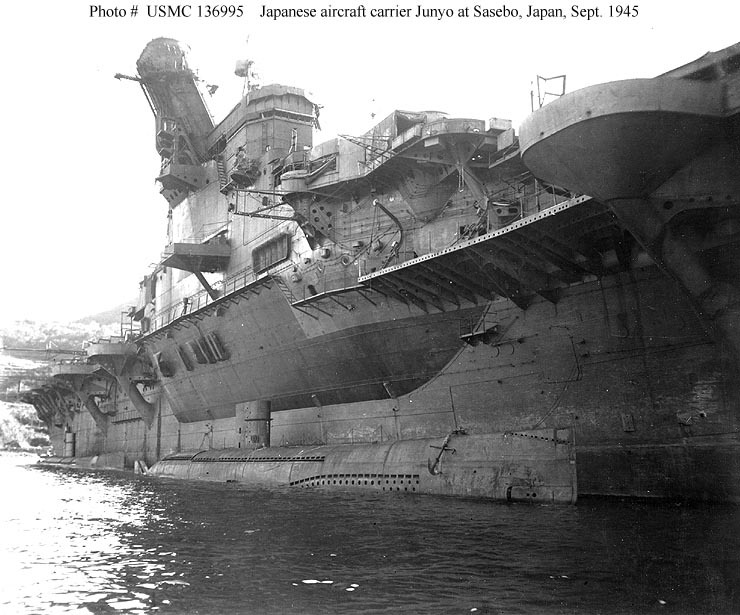 However, they were the first Japanese carriers to direct their uptakes through the island, and the island was sponsoned out so that it did not encroach on the flight deck. The hulls were asymmetrically bulged to compensate for the island. 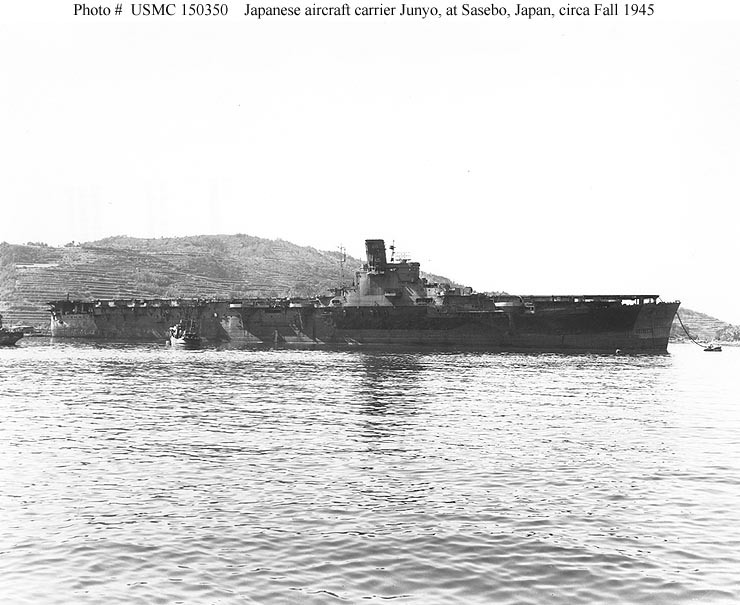 Junyo had four boilers rather than the six of Hiyo, giving her a slightly slower speed of 24 knots. The original air group was 18 D3A "Val", 18 B5N "Kate" and 12 A6M "Zero" plus a few spares. Like the Americans, the Japanese seem to have increased the proportion of fighters in their air groups as the war progressed, and Hiyo was operating 27 "Zeros", 6 B6N "Jill", and 18 "Vals" by 1944.